Figure 1. Global Current Balances for Select Country Aggregates. Note sum of surpluses and deficits do not equal due to statistical discrepancy. Source: IMF, WEO, October 2018. 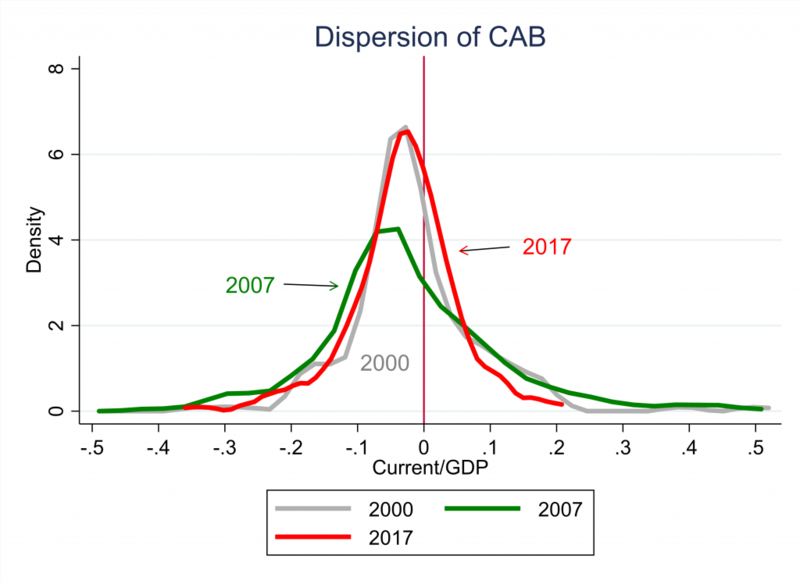 While the imbalances havea reappeared (see my Jackson Hole paper), the dispersion of current account imbalances has not yet come close to that witnessed in 2007, on the eve of the Great Recession. 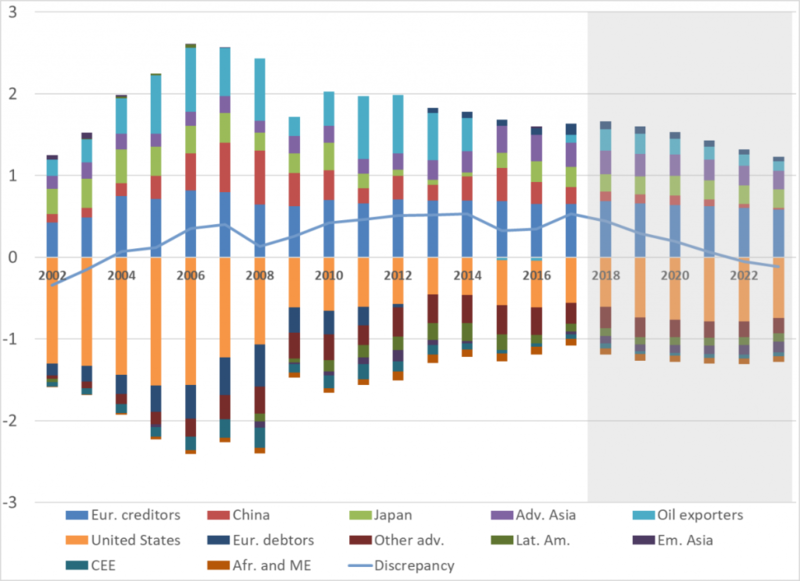 Global current account imbalances have reappeared, although the extent and distribution of these imbalances are noticeably different from those experienced in the middle of the last decade. What does that recurrence mean for our understanding of the origin and nature of such imbalances? Will imbalances persist over time? Informed by empirical estimates of the determinants of current account imbalances encompassing the period after the global recession, we find that – as before – the observable manifestations of the factors driving the global saving glut have limited explanatory power for the time series variation in imbalances. Fiscal factors determine imbalances, and have accounted for a noticeable share of the recent variation in imbalances, including in the U.S. and Germany. For advanced economies, the financial component of the current account has been playing an increasing role to determine the movements of the account. Examining observable policy actions, it is clear that net official flows have been associated with some share of imbalances, although tracing out the motivations for intervention is difficult. Looking forward, it is clear that policy can influence global imbalances, although some component of the U.S. deficit will likely remain given the U.S. role in generating safe assets. More, from the IMF, here and here. Ito and I are currently working on a companion paper, examining how components of the current account respond differently to shocks. It’s so interesting you posted this paper now, as Michael Pettis recent post had been fluttering around in my brain in the last 48 hours. And it seemed some of his thoughts seemed to semi-diverge from your own, as regards individual countrie’s fiscal policy affects on their trade surplus/deficit. I may have to read it again to make sure I understood it correctly, but seemed he was diverging off of your thinking and mainstream economists (I think??) thinking on this. Whatever one thinks of Pettis, he is one of the more deeply knowledgeable “white dudes” as regards China’s economy—and I don’t grant that compliment very easily, as I think too many false prophets get attributed that tag. I’m enjoying reading this paper very much and the style it is written in. I am having many questions entering my mind and thoughts wandering in and out as I read. One of the questions is, why has China’s most recent 5-year breakdown on net official flows gone from 8% to what looks like about 0.75%??? Roughly 7.25% is a “dramatic” drop yes??? The paper says the effect of “intervention” shrank China’s current account surpluses overall. I know this may qualify as the big dumdum question of the day, but “intervention” here means what??? . Purchases of U.S. government bonds and treasuries?? They have done less of this in the last 5 years?? What was the main item that caused that drop?? Two things stand out in that graph. The US current account deficit and the European current account surplus. So why isn’t Trump blaming Germany. Oh yea – he is scared of Merkel. Trump cannot stand up to strong women for some reason! First he wanted to kill NAFTA. Then we got USMCA (sung by the Village People) and all was beautiful even though this was NAFTA 1.1. But then he did not get his racist wall and his base feared that might see a brown person so he was going to close the border for a long time. Oh wait – never mind, just put tariffs on anything that has to do with cars. Lord – this man is truly insane! He gonna tariff it, and he’s not kidding. I like the F-bomb version better, but I don’t wanna cause Menzie too much hassle today. Oh? Did they ever go away? Menzie is speaking in relative terms here. I think Menzie is even leaving the door ever so slightly ajar on that. He even says something like “gone on holiday” in the early part of the paper. It is semi-connected to global economic activity, seemingly becoming worse (larger imbalances) when things are on the active uptick. Menzie is welcome to punch me hard in the shoulder here if I am misquoting in my paraphrase. Trump today: economy is doing better than ever so the FED should lower interest rates and restore Quantitative Easing. Where did he get this utter nonsense? Oh yea – Kudlow must have written the latest stupidity from the Idiot in Chief. BTW – http://www.bls.gov news had the employment to population ratio declining from 60.7% to 60.6%. So no – not best economy ever. “If Herman Cain were on the Fed, you’d know the interest rate would soon be 9-9-9,” Romney said in an interview on Thursday afternoon. I bet Romney thought that was clever. Right up there with “corporations are people too” and “repeal and replace”. Actually 9-9-9 was a better tax proposal than that idiotic garbage Romney 2012 was pushing. Cain is not qualified to serve on the FED but Romney is not qualified to comment. If Herman Cain wanted to be a real smart aleck he could ask Romney if he prefers the number 47, and watch Romney get real quiet about numbers after that one. If that doesn’t work, Cain could do the old pro-wrestling move known as “the double-whammy” and ask Romney what his conservative Utah constituency thinks of people who profit off of dead fetus tissue. That’ll make for a great conversation piece at Romney’s next Church Breakfast in Park City Utah. An excerpt from Michael Pettis’ piece that I think is fascinating. And I’m curious if other economists on either side of the political aisle would like to shoot this theory down?? “I show in that post that in economies like the United States, in which the profitability of most investments is a function of changes in demand (the second category) rather than in the cost of borrowing (the first category), rising income inequality and higher ex-ante savings can actually result in less investment rather than more. Good enough. Menzie should decide whether he is writing an academic paper or writing headlines for USA Today or CNN.